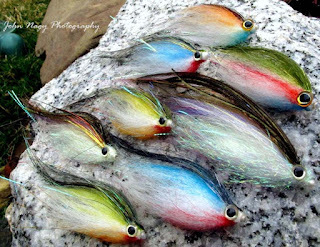 The following is Part II of John Nagy's three part series on Tube Flies for Great Lakes Steelhead. (See Part I of the series in the right menu bar). For getting tube flies down in faster, deeper flows, cylindrical metal tubing has always been popular. Various lengths of metal tubing and types (weight), including copper, brass, stainless steel and aluminum allow for a degree of sink rate control depending on the water being fished. They typically incorporate an inner plastic “liner” to deter leader abrasion. Using long sections of heavy metal tubing (like copper, brass and stainless steel) can be problematic though in a number of ways. 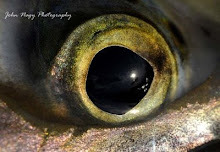 These include unnatural swimming action and “hang-down” (rear tilt) of the fly on the swing, difficulty in casting and limited fishability of fly (in slower flows) due to weight. Bulky/unsightly finished tying heads as well as awkward wing angles (which are unavoidable when tying on large diameter metal tubing) are also common with straight metal tubing. Metal tubing rear hang-down can be remedied to a certain extent by using a heavy conehead at the head of the tube fly (which has a balancing effect). The issue with this design though is its total mass (heavy tubing and conehead) which has the effect of further deadening the lively action of the fly on the swing. Plastic tubing is obviously lighter than metal tubing and actually has a “buoyant” effect in the water. This lightness and buoyancy is an asset though, because it can make a tube fly swim much more naturally in the water versus a heavy cylindrical tube design. Actually light plastic tubing can be fished effectively in most water types (except for the super fast/deeper flows). The caveat is to rely on a sinking system (such as a sinking leader or fly line sink tip) for getting it down in the current. A small added weight to plastic tubing such as a light conehead is recommended for leader turn-over on the forward cast with plastic bodied tube flies. The addition of a conehead and compact metal tube “weight” or metal “bottle” tube (see bottle tubes below) also allows for precise fly balance and weight control when constructing tube flies with plastic tubes. Tube flies constructed with light plastic tubes (and a small added weight) or made with an aluminum tube body will swing at the same level as your sink tip or sinking leader. These tube types ideal for swinging flies through long runs and riffles as well as large pools with broad tail-outs that have even stream bottoms where it is not required to “drop down” quickly into a steelhead lie. Typically with these lies current speeds are of the moderate to slow type. Steelhead lies located below sharp drop-off’s and in narrow slots and in deeper, super fast runs are best reached with copper tubing. But as discussed earlier the heavy mass of this tubing can negatively effect natural fly action and are difficult to cast. Brass seems to be the best material in terms of weight (and castability) to get down into most fast current steelhead lies without compromising fly action too much. Although it is recommended to keep the leader more on the long side when using brass bodied tube flies to keep the sink tip from raking the stream bottom and “hanging-up” on the swing. Metal “bottle” tubes were designed to address some of the inherent issues characteristic with cylindrical metal tubing. The first bottle tube was machined by The Fly Company in Denmark. It was called the Morrum Bottle Tube (named after the salmon and sea trout river in Sweden), was shaped like its namesake and was much shorter than cylindrical metal tube designs. The Morrum Bottle Tube concentrated weight slightly to the rear of the fly, giving the tube fly better balance and a natural action and movement to the fly on the swing. The conical front end also made for a pleasing wing shape and angle and somewhat small tying head. They were made in made both brass and aluminum versions. Loop, Bidoz and Stonfo quickly followed with their own bottle shaped metal tubes. Like cylindrical metal tubing, bottle tubes incorporate an inner plastic liner tube for line abrasion protection. The small diameter of the “collar” portion of a bottle tube allows for smaller finished heads versus tying on straight tubing. A short section of “junction” tubing facilitates hook connection to the rear of the bottle tube. -Can be extremely compact (especially when made of tungsten) for fast sinking. -“Compact” bottle tubes can also be easily concealed in dubbed and wrapped tube bodies. Over the years the standard bottle tube were tweaked and modified into various “hybrid” bottle tube shapes including the Shumakov ½- incher, Eumer Teardrop, Canadian Tube Fly Company Nubby Tube, Wurm Tungsten Bottle Tube, Foxy Tails Compact Tubes, Skeena Shrimp Tube and the Futurefly IC Tube. Metal hybrid bottle tubes combine the excellent sinking ability of cylindrical metal tubing and the lively action inherent with plastic tubing into one design. They are typically made of brass, aluminum and tungsten for sink rate control as well as in painted colors (including bright neon’s) and metallic finishes. They characteristically use extended sections of the rigid plastic liner for tying the tube fly itself (in front of the metal bottle tube). This design innovation allows for even smaller finishing heads and slimmer tube fly bodies, which results in not only aesthetically pleasing finished heads but tube flies that can sink faster in a river flow. Many bottle tubes (including hybrids) can accept rigid plastic tubing in the rear of the bottle tube via a machined body ridge or ridges. The hook is then inserted directly into the rear of the rigid plastic tubing. This allows the option of tying a tube body on the rear plastic tube or using the exposed colored tubing “stand alone” (they come in a numerous colors, including neon’s, flecked and glow-in-the-dark varieties) to act as a rear attractant tube body itself. Rear tubing length also allows for flexibility in rear hook placement which is ideal for long streamer and baitfish type style patterns (although some steelheaders like to use a “free-swinging” hook in long winged patterns to prevent hook entanglement). The rage these days in the tube fly world are “buildable” systems which offer a variety of tube fly components. These including standard metal and plastic tubing, coneheads and junction tubing as well as more innovative/unique stuff like hybrid bottle tubes, “two” dimensional plastic tubing, flexible/colored plastic tubing, hard plastic liner tubing, tapered junction tubing, glow-in-the-dark tubing, “needle” tubes, modified coneheads, spinner blades, propellers, tube beads and tube weighing components. These systems lend themselves well to the beginning tube tyer, readily being adapted into various already proven patterns. 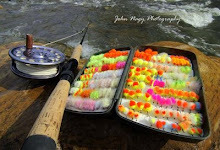 They also encourage a great deal of creativity for experienced tube tyers (“mixing and matching” is possible but some systems are “proprietary”) in developing new tube fly patterns and designs as well as optimizing fly performance. Check back again with John Nagy’s Steelheader’s Journal for Part III of Tube Flies for Great Lakes Steelhead by John Nagy. Article will include list of tube fly component manufacturer’s and sources of tube fly components in the USA and internationally as well as a discussion on tube fly system interchangeability. 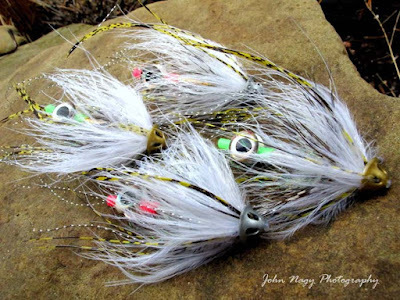 More detailed information on tube flies for Great Lakes Steelhead (including over 28 hot tube fly patterns) can be found in John Nagy's classic book "Steelhead Guide, Fly Fishing Techniques and Strategies for Lake Erie Steelhead". 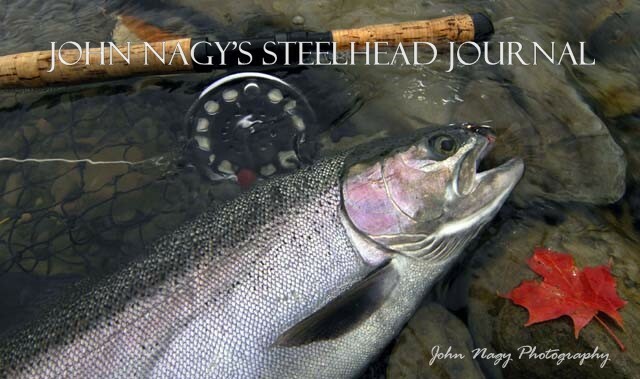 His "Steelheader's Journal" makes a great companion book to the Steelhead Guide and is now available.